We all know that dry mortar production line is the production of dry mortar equipment, but many people do not know that the working principle and complete configuration of dry mortar production line. Today, I will introduce the working principle and the complete configuration of dry-mixed mortar production line. The outer spiral belt will move the material from both sides to inward, and allowing the material to mix back and forth. While the other part of the material moves radially in the axial direction and forms a convection circulation in the driving of the spiral belt. Due to the mixing movement, the material can be quickly and uniformly mixed in a short time. In the dry mixer, the finished product is quickly placed in the finished product silo and buffered and stored through the pneumatic quick opening. Finished storage silo and packaging machine are measured and packaged with a soft connection. For relatively large users，a belt conveyor can be added to the back of the packaging machine, and then the belt conveyor can be transported directly to a specific area by a truck. Normally, an annual output of 20,000 tons of mortar production line will be equipped with 3-6 raw materials tank, and two of which can be used to load bulk cement and fly ash, and small tank is used for loading light calcium, heavy calcium, sand, small materials and so on. The bulk, cement and fly ash are put into the tank, which does not require lifting equipment by relying on the pump truck. 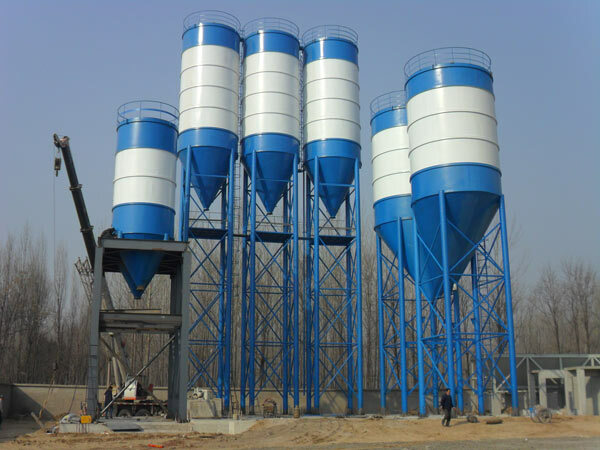 The silo usually adopts cylindrical support structure, and the upper part of the silo is equipped with dust removal equipment to prevent dust leakage, and the lower part of the silo is equipped with broken arch device to prevent powder reunion, which ensure the smooth discharging of powder in the production process. The silo is equipped with a material level sensing device to facilitate the use of material within the warehouse. Light calcium, heavy calcium, sand and small materials need to use bucket elevator, and this ingenious material distribution system can avoid the waste of resources. The metering system places the raw materials into the measuring silo and completes the measurement by the feedback from the sensor data. After the measurement, the material enter into the mixture bin through the screw conveyor. When the mixing hopper is opened, the material to be mixed quickly enters the gravity mixer to achieve continuous production of all kinds of mortar mixtures.